In December 1972, Jean McConville, a thirty-eight-year-old mother of ten, was dragged from her Belfast home by masked intruders, her children clinging to her legs. Her abduction was one of the most notorious episodes of the vicious conflict known as The Troubles. Everyone in the neighborhood knew the I.R.A. was responsible. But in a climate of fear and paranoia, no one would speak of it. In 2003, five years after an accord brought an uneasy peace to Northern Ireland, a set of human bones was discovered on a beach. McConville's children knew it was their mother when they were told a blue safety pin was attached to the dress—with so many kids, she had always kept it handy for diapers or ripped clothes. 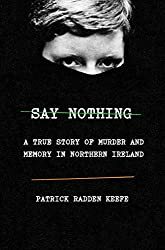 Patrick Radden Keefe's mesmerizing book on the bitter conflict in Northern Ireland and its aftermath uses the McConville case as a starting point for the tale of a society wracked by a violent guerrilla war, a war whose consequences have never been reckoned with.